Up to 1000 boats were ringing the race area just off the city front. Tens of thousands of fans were lining iconic Navy Pier. Bars, restaurants and fan zones were heaving. The best sailors and fastest boats were ready to show what they could do. After phenomenal practice racing on Friday, with two capsizes, the wind took its time to co-operate. So while fans enjoyed a great day on Navy Pier, officials took the ‘substitute race’, which was sailed on Friday, and scored it as Race One of the Louis Vuitton America’s Cup World Series Chicago. That victory went to SoftBank Team Japan who would have seen a measure of justice in having Friday’s 'substitute race' count on the leaderboard. In New York, the team won the substitute race, but it was never used. But in Chicago, with winds too light and unstable to start on time, the substitute race was inserted in the broadcast and scored as an official race. 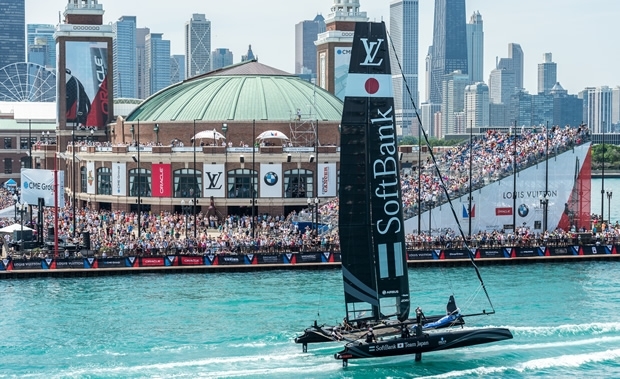 It was the first win of the Louis Vuitton America’s Cup World Series for SoftBank Team Japan. Artemis Racing scored second place and Groupama Team France was third. On the other side of the ledger was Oracle Team USA, who capsized in the substitute race on Friday and who now must carry that last place finish on the scoreboard. As Saturday afternoon progressed under steamy, sunny conditions, and with the sea breeze taking its time to settle in but picking up, race officials and teams extended the race window beyond the initial 3:00pm deadline and were eventually able to get one late afternoon race completed for the fans on Navy Pier. This race was a huge crowd-pleaser and is designated as a ‘substitute race’ for Sunday. Should conditions not allow for racing to progress as scheduled on Sunday, it will be inserted in the international broadcast and scored as an official race. Emirates Team New Zealand were the top team on Saturday, finishing ahead of Oracle Team USA and Artemis Racing. “The race today was a tough battle in front of some really impressive crowds," said Artemis Racing skipper Nathan Outteridge. "I’m pleased we were able to put on a race for everyone who turned up as the fans here in Chicago have been awesome." “The amount of people on Navy Pier and the number of boats out on the water made for a pretty amazing experience to be out there sailing in front of them all," said Emirates Team New Zealand skipper Glenn Ashby. Conditions are predicted to be excellent tomorrow, setting up a fantastic finish for Super Sunday.